We've had a lean fishing year....which translates to no fishing at all so far. Finally, Mr. Squash and I were able to go out on the Yakima River with a guide. We just returned home yesterday and had a wonderful time! At first the weather report said we would be rained on all day! We prepared for the worst, but thankfully, it didn't affect just the area where we fished! Most of the day was like this - partly cloudy and pretty crisp. When it came time for lunch, our guide Mike anchored the boat on a nice stretch of the river and set up a table and chairs for lunch! Now this is what we call living! 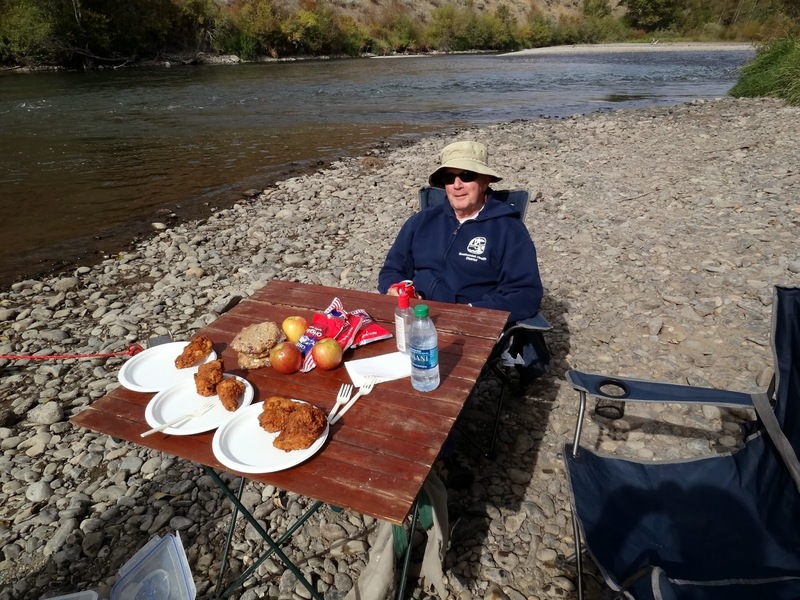 We had fried chicken, apples, a cucumber/squash salad that isn't in this photo, chips, cookies and cold water. Everything was delicious! Then it came time to get back in the boat and do some more fishing! 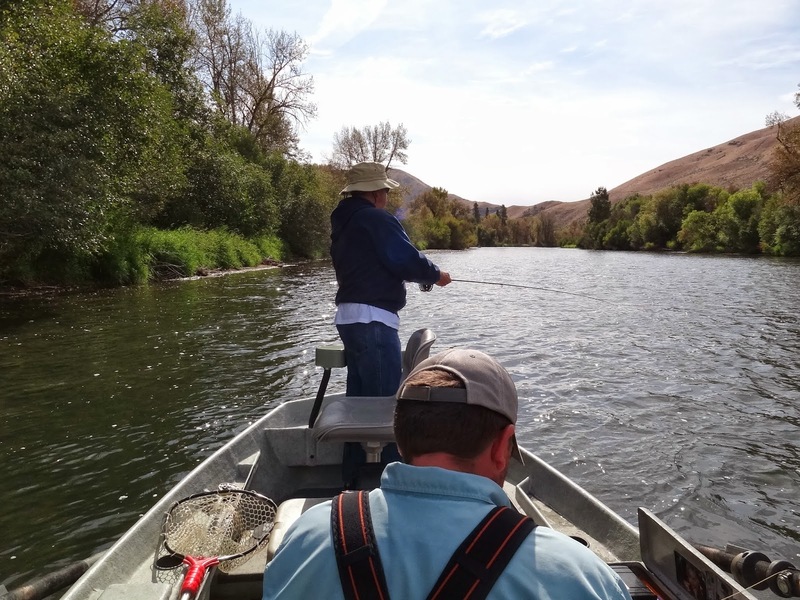 If you look closely, you'll see a nice cutthroat trout in the net! Mr. Squash landed it beautifully and the guide netted it so he could release it back into the river. 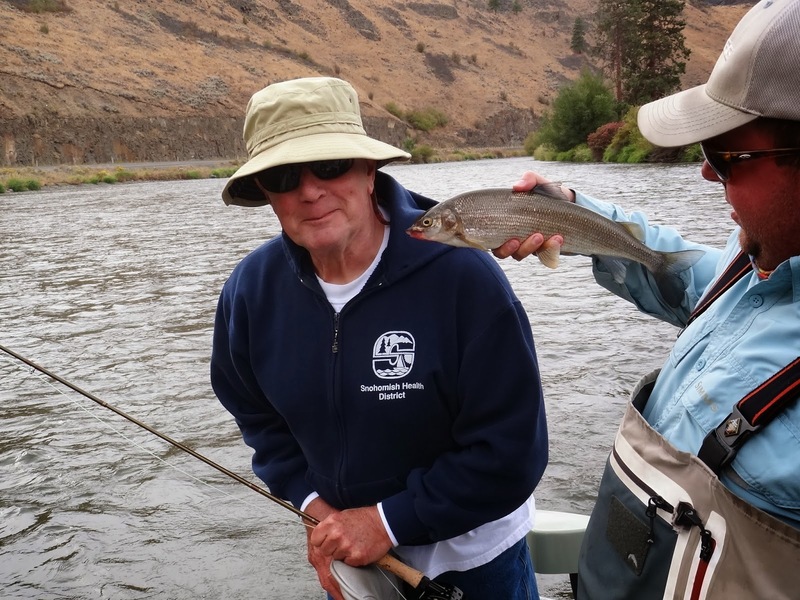 The Yakima is a world class river, all catch and release. We asked Mike how far away from home people came to fish the river. He said he's had guests as far away as Japan and Austria! 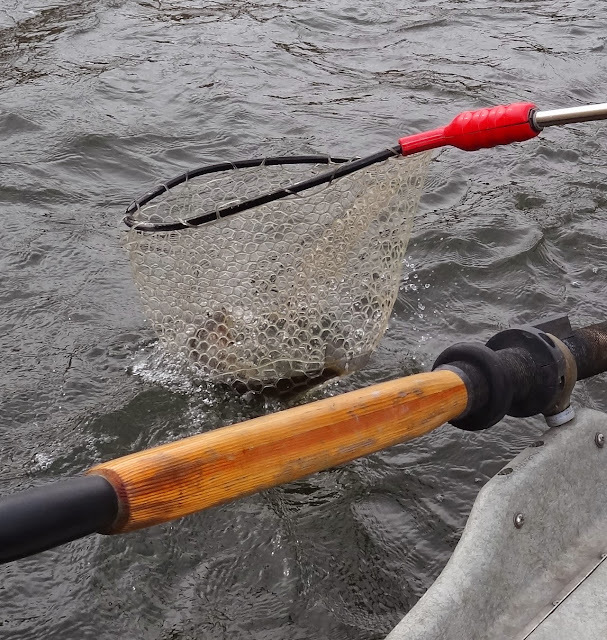 One nice thing about going out with a guide - they net the fish, unhook it and put it back in the river! Here's another nice fish Mr. Squash caught! In addition to fish, we saw quite a bit of wildlife. 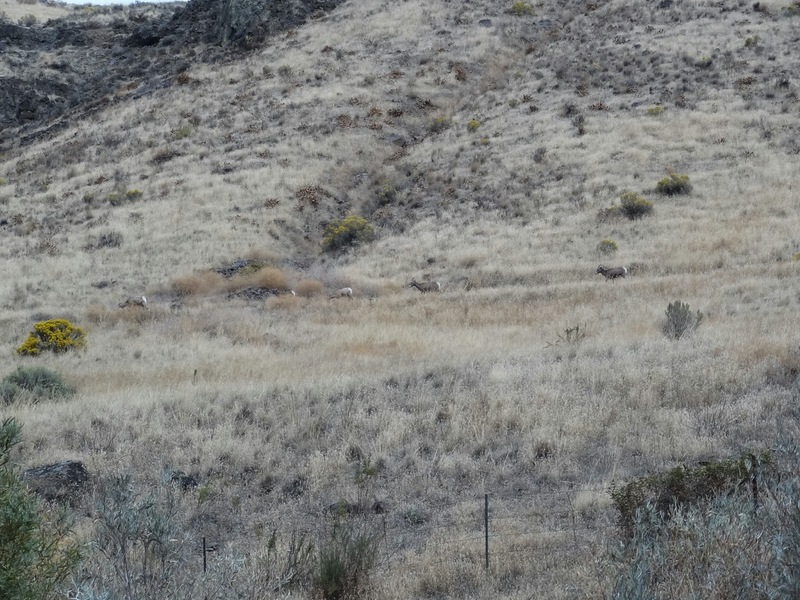 If you click on the photo above there is a small herd of bighorn sheep - all female here. This large heron flew back and forth around us and he finally landed for a nice photo shoot. In case you can't see him - he's on the right side of the photo. This interesting wildlife is us taken on the Umptanum bridge. I am layered up under my fishing waders which is why I look like a little doughboy! We told the guide we really wanted a good photo to use on our Christmas card this year. Hmmmm....maybe not this one (wink). Mr. Squash did well with his fishing! Gorgeous photos and such a peaceful looking place. If you don't think the photo will be a good Christmas card how about an 8 x 10 glossy for your wall! I like the photo...it looks 'real'! How fun...still a good picture for a card however maybe one of you two with your kitty cats. Are you going to the Walla Walla Quilt show? Cathy is there all set up and ready to have a great weekend. What beautiful photos!!! Looks like an amazing time!!! I have to say I really liked the pic with the fried chicken...YUM...lol! Mr Squash caught some nice fish ! SO glad it did not rain . I really enjoyed the photos . Just beautiful ! Oooh, you are close to my neck of the woods. Looks like a great day of fishing and nature! I like the photo! Looks like you had a wonderful day. Fall and cooler weather will be here all too soon. Oh, it looks like you guys had a great time!!! Isn't it wonderful to be out in the wide open spaces? What a fun trip. Cliff and I so enjoyed meeting you both today. It was a fun day to be sure and I had my camera and forgot to take pictures. I guess I need to put it around my neck so it's under my nose. Hugs!! You just know I'm envious you get to fish! You both look super happy to be fishing! I really like the pic of the two of you together! So glad you got to take time for a fishing trip. 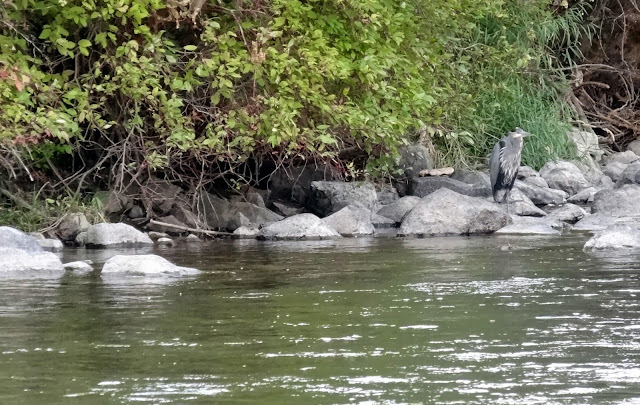 I love that photo of the heron. I think that is a great shot of you two for you Christmas card. Beautiful outing on a peaceful day.. the scenery around you is wonderful! Mr.Squash had a good catch for the day. I love your casual picture and sweet smiles! 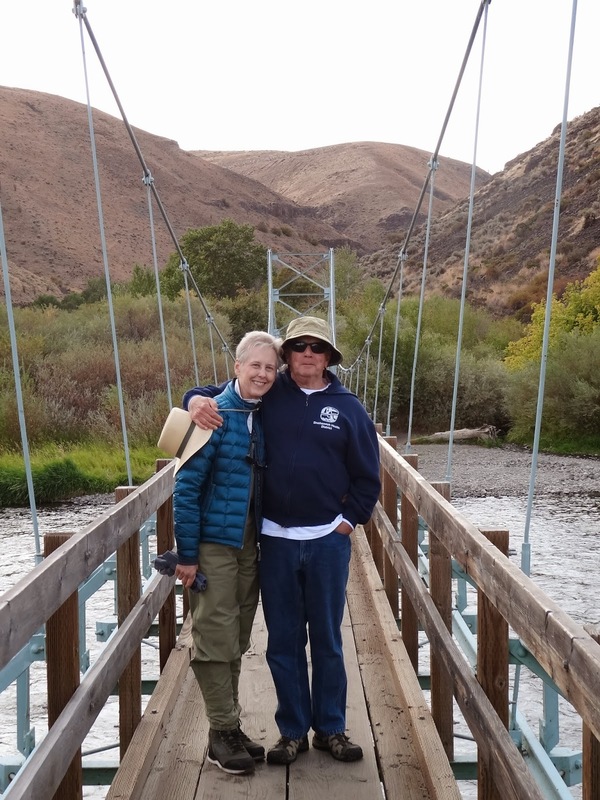 I'm so happy you both had a wonderful time on your trip! Congratulations to Mr. Squash on his successful fishing. I really like the potential Christmas card photo...Life is Good! I'm sure the girls are happy you are home.